RN486 not only potently and selectively inhibits the Btk enzyme, but also displays functional activities in human cell-based assays in multiple cell types, blocking Fcε receptor cross-linking-induced degranulation in mast cells (IC50 = 2.9 nM), Fcγ receptor engagement-mediated tumor necrosis factor α production in monocytes (IC50 = 7.0 nM), and B cell antigen receptor-induced expression of an activation marker, CD69, in B cells in whole blood (IC50 = 21.0 nM). 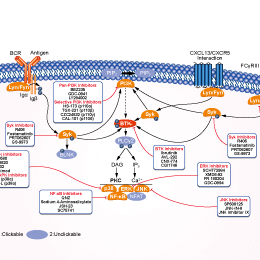 RN486 is able to block the signaling of BCR as demonstrated by a marked inhibition of phosphorylation of both Btk and PLCγ2 in B cells. 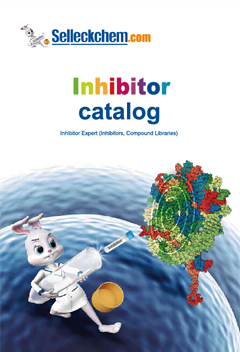 RN486 displays a selective B cell inhibitory profile in BioMAP Systems. Xu D, et al. J Pharmacol Exp Ther, 2012, 341(1), 90-103.